Download the short, quick recording form (right). A more detailed, advanced version and online surveys are available via the links below. Audio and video files can be sent via WeTransfer, free of charge. Simply add the file(s) and send to info@hallamec.plus.com. Include your own e-mail address and a short message/description. The case study covers a core area of Sheffield and the Peak District but extends east beyond to Doncaster and the Yorkshire lowlands, north to the south Pennines and adjacent areas around Barnsley, Huddersfield and Bradford. Southwards the survey extends to the Dukeries and Sherwood parts of Nottinghamshire, and to north Derbyshire too. 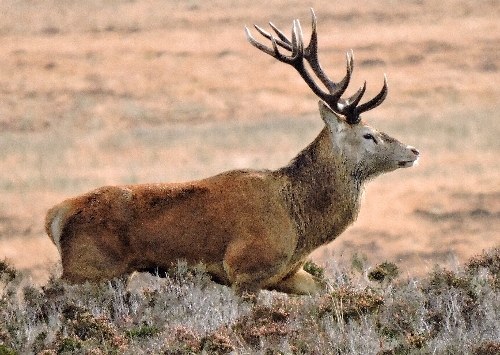 In the core part of the study area, the situation is especially interesting because at the start of the research deer were restricted to very localised long-established former park herds of fallow deer and red deer, a handful of extant park herds, and some roe deer in the eastern periphery. ​Over a 20-year period, deer of four species have undergone remarkable changes in status across this wide area of the northern English Midlands. Today, the Peak District National Park has large herds of red deer on the moors of both its western and eastern flanks, a well-established herd of fallow in the southeast, and even roe deer now increasingly recorded. To the east, in the major industrial centres such as Sheffield, three species (including the exotic muntjac but not fallow), have colonised into the urban area, and both roe and muntjac have been sighted almost into the city centre. Since the demise of all but a handful of ancient deer parks in the region, perhaps three to four hundred years ago, these large, herbivorous mammals have been absent and this changed situation represents a dramatic and perhaps unprecedented transformation. Furthermore, it is suggested that the next ten years will witness a further and major colonisation of deer into the urban environment. ​Since 1980, a most remarkable change in status of deer has occurred across the study area. Four species of deer have colonised, or in the cases of red and roe, re-colonised the region. Of these, the fallow has changed the least and remains locally-abundant but only in two or three main strongholds. Roe, red and muntjac are actively moving into rural and urban fringe areas, and will in the next ten years, have penetrated deep into urban heartlands. The population levels are now rising to a point where on-site counts and behavioural studies become possible. This has been the case with the Eastern Moors red deer population centred on Big Moor in the eastern Peak District. Applying the HillDeer computer model developed by the Macauley Institute at Aberdeen it has been possible to compare computer predictions to real-time field counts and to look at future scenarios with and without deliberate culling. At present the population remains unmanaged and so represents an exciting example of an unplanned ‘re-wilding’ project. However, whilst hugely exciting to many locals and even from an academic standpoint, the situation does cause anxiety to the Peak National Park Authority and to the partnership of the National Trust and the RSPB now charged with caring for this landscape into the future. Expanding into a series of wider sub-populations, the Red Deer are now moving down-slope and into the well-wooded river valleys of urban west Sheffield. This exciting process is the subject of ongoing monitoring.